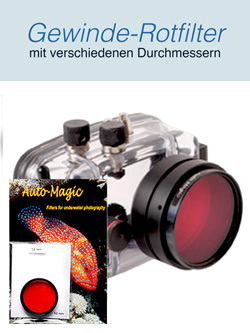 welcome to our website, magic-filter.de! The human eye is able to distinguish more than 20 million different colours. Unfortunately water starts from the surface to absorb the red fractions in the light. 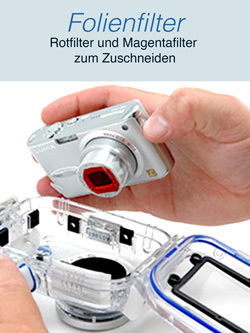 So your video or photo gets a more bluish cast the deeper you go. Magic Filters are created to bring back the colour in your holiday memories. 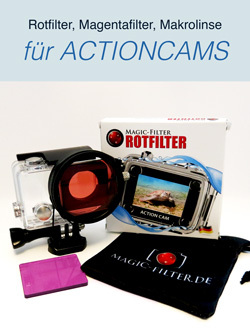 Red filters reduce blue tinting, magenta filters reduce green tinting and macro lenses faciliate to perform close-up views with action cams. 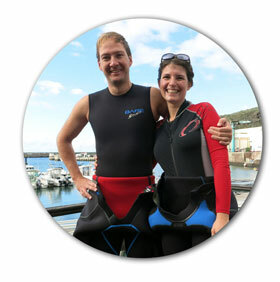 Have a nice time at our website and may your dive be sharp and full of colors! Auf Divecooky's Tauchblog erfahrt Ihr die 6 goldenen Regeln zum Tauchen mit Rotfilter.